Do you make your own costume? 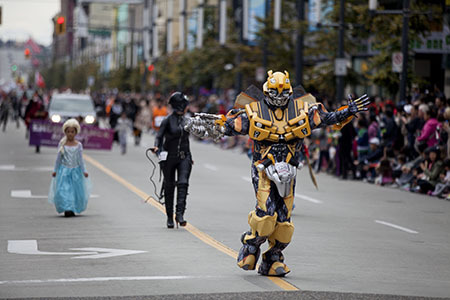 No: To show your purchased costume on the Halloween parade, you'll need a ticket. Access to all ticketed performances. Access to Cosplay Maid Café. 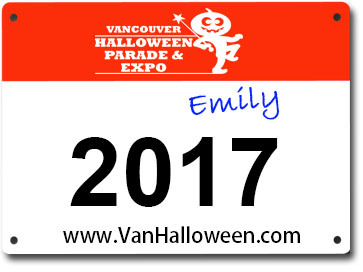 All parade participants must come to the Halloween Expo to pick up the Super Pass, which identifies you for parade participation. 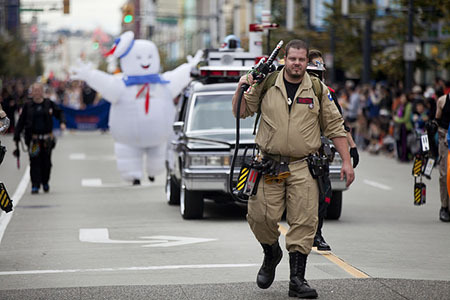 Time: All participants must arrive at the assembly area before 10:30 AM Sunday Oct 13. Location: Check-in at Parade Command desk at the front of 828 Drake St, Vancouver (intersection between Drake St and Howe St). After check-in, please wait on the street at the front of the building. Remember to peel off and stick the Ticket on you, or use a safety pin to attach it. If you didn't form a team, feel free to look for characters from the same character origin (e.g. Avengers, Dragon Ball, Sailor Moon) and walk together. A Parade Marshal is assigned to your marshalling section. They will direct you into your assembly location and guide you into proper sequencing as parade enters out to the Parade Route. PLEASE PAY ATTENTION TO THEIR DIRECTIONS. Any enquiries about the parade are to be directed to the Parade Marshall. Private vehicles are NOT allowed in the assembly area. If being dropped off via car, please use the drop off zone area on 1200 Burrard Street. You can then walk down to assembly area. Please arrive in time! The parade will start without waiting. This is a family-friendly event. Public safety is our first priority. 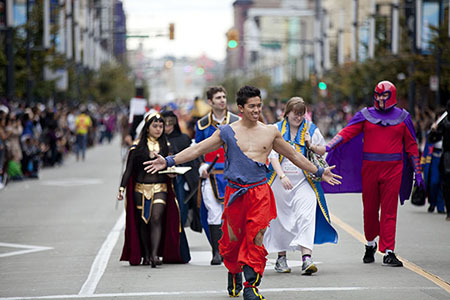 The following rules and regulations are strictly enforced on costumes. No blood or gore (zombies are welcome but no blood please). No hateful costume or body parts. No metal weapon or sharp object (please use plastic or wood). No replica gun (please use toys significantly smaller or larger than the real version).